There’s a wonderful range of classics in English and French, and on the third floor, there’s an even wider variety, including biographies, non-fiction, history, children’s books and more. There is also a smaller selection of books in German, Portuguese, Hungarian, Danish, Arabic, Chinese and a number of other languages. The shop is spread over three floors and each floor is huge, so you’ll want to allow yourself at least a couple of hours to explore and browse. Anyone who has visited the famous Shakespeare and Company bookstore in Paris will notice similarities in terms of the ambiance of the place, which feels like that of another era. There are many wonderful little nooks and crannies to get lost in, and chairs and sofas to snuggle up in while you decide which book you’re going to buy! The store is decorated with vintage posters and antiques, and the creaky wooden floors add to its quirkiness. It also has that irresistible scent of old books. Pick up a book, flick through the pages and breathe it in… mmmm! The books are quite reasonably priced and all of them are second-hand. Most of the average-sized books that I picked up cost between $12,000 and 35,000 pesos ($4-12 US dollars) and were all in an acceptable condition. There were also old editions of comic-books and magazines from all over the world, including Time magazine and National Geographic in English. If you’re looking for a good book to read while you’re in Colombia, you absolutely must go to Merlin. You’ll be sure to find something that looks interesting, and the staff were also really helpful and attentive. I can’t believe it’s taken me nearly four years to find out about this place! Wow! 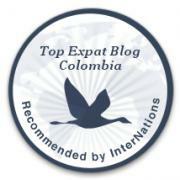 very interesting, i never heard of it before, and i visited many times and walked all around la Candelaria. Great find and really appreciate you letting us know about it. thanks Samuel, it’s really worth a visit if you’re downtown!